Cayosoft® Suspend™ quickly and accurately secures Active Directory Users or Groups by performing the best-practice steps required to safely deactivate the objects thereby preventing costly security and compliance violations. As employees leave the organizations it is important to revoke access in a timely manner. Some leave temporarily for reasons such as military or medical leave and some leave permanently due to retirement or termination. Cayosoft Suspend will also schedule suspensions so they are not forgotten and there is no need to keep a separate calendar of departures. Suspend also works with Groups preventing the group from being used for security operations allowing the group to be safely deactivated. If the group is needed, a simple right-click undo will restore the group to the previous active state. The Cayosoft® Suspend™ solution deploys in less than 10 minutes, is easy to use and requires no heavy service or infrastructure. Suspend allows you to temporarily or permanently suspend AD Users and Groups without physical deletion so you can bring them back with the click of a mouse if they are again needed. 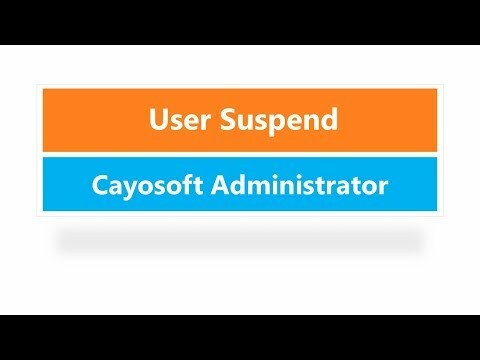 Suspend works with Cayosoft Admin Assistant to allow you to pre-schedule a suspension on a pre-determined date. Cayosoft Suspend is a part of the Free Active Directory Management Tools from Cayosoft. In minutes, the easily configure policies begin to enforce consistent and effective control that meet your IT or Compliance requirements for revoking access. With Cayo | Suspend your administrators will no longer struggle to perform dozens of potentially error prone steps and you won’t have to maintain risky or awkward scripts. Cayo Suspend complements Microsoft Forefront or Oracle Identity manager by helping resolve conflicts though integration of native AD management tools and these powerful solutions. It is natural for people to join and leave an organization. Sometimes people leave an organization temporarily for medical reasons or for military deployments. Permanent departures are typically due to retirements or terminations. In both cases, security and compliance requirements demand that the user’s Active Directory account must be terminated quickly and accurately. Unfortunately, Active Directory provides only Delete or Disable as options. To properly suspend and secure Active Directory users or groups, a complex and potentially error prone process must be followed. Because native tools lack a “suspend” process, security and compliance requirements are put at risk. Improperly suspending a user or group can cause the organization to be subject to security breaches, SOX, HIPAA or PCI audit failures and potential fines. Deleting users and groups is unacceptable because they are unavailable when needed for audit or security reasons. Disabling a user account is risky if additional steps are not taken to ensure the account won’t be re-enabled with unintended consequences. Disabling a group isn’t provided by Active Directory. Better than Delete & Disable: Cayo | Suspend delivers something better than Delete or Disable; it puts a “Suspend” command at your fingertips. Suspend invokes Policy Workflow steps that prevent user accounts from authenticating and group from being used for security or distribution list operations. With right-click undo, reactivating the user or group is just a mouse click away. When should you suspend users or groups? Any time a user or group is suspended the actions taken against the object must be recorded and available for review by auditors. Cayo | Suspend provides auditor friendly reports that are just a mouse click away. Both Suspend and Un-Suspend reports storage options are also provided. Thoughtful product Integration provides a service component that monitors AD for Suspended Accounts and enforces the object retention policy. Policy Suspend™ is sold as part of Cayo Administrator™ or it can be purchased individually. The software is licensed per enabled Active Directory user in each domain to be managed. The pricing shown here is for a Perpetual Licenses that never expire. For individual module or subscription based pricing, request a custom price quote here. Price: Starting at $7 per enabled user before discounts for a Perpetual License that never expires. Support & Maintenance: Initial license purchases are accompanied by a 1 year software maintenance agreement that begins on the purchase date and continues for 12 months. Subsequent yearly software maintenance is optional and amounts to 20% of the license purchase price.